So, I mentioned this previously when discussing Teenage Mutant Ninja Turtles: Turtles in Time Re-Shelled, but there’s a clean demarcation line in quality that falls somewhere around the release of Teenage Mutant Ninja Turtles Tournament Fighter where the franchise kind of went into a nosedive and never quite recovered. Ubisoft’s acquisition of the franchise, while it left those of us who still loved the franchise and wanted to play more good games from it hopeful, hasn’t done a lot to change that trend. The re-release of Teenage Mutant Ninja Turtles The Arcade Game on Xbox Live, complete with online play, was nice, absolutely, and the TMNT game for the Gameboy Advance was sweet, no question. However, the console and non-GBA handheld TMNT games were like a dumbed-down, less enjoyable Prince of Persia, and the aforementioned TMNT Re-Shelled is flawed at best and divisive at worst, so at this point, we have reason to be disappointed. One thing Ubisoft has shown that Konami really didn’t, however, is a willingness to really try out everything they can until something works. Konami tried experimenting with the series in the beginning, but after a while, both in the nineties and during the reboot of the cartoon series, they essentially just found something simple that worked and stuck with it. Ubisoft, however, has been throwing the franchise at multiple genres, from beat-em-up (TMNT Re-Shelled, the upcoming TMNT Arcade Attack, the GBA TMNT) to platformer (the other TMNT games) and now, to fighting with Teenage Mutant Ninja Turtles: Smash Up. The game is less of a conventional fighting game and more of a Smash Brothers fighting game, but let that not color your perceptions: TMNT: Smash Up is surprisingly capable of standing on its own two feet. It owes its existence to the franchise, and even references as such in the title, of this there is no question. It openly rips the franchise off in a whole mess of different ways, of that there can be no denial. I mean, hey, Ubisoft even brought in Game Arts to develop the game, and besides Lunar, Grandia and… uh… Silpheed, I guess… what else have they had a hand in developing? That’s right, Super Smash Brothers Brawl. So, yeah, the similarities could only be more obvious if Mario himself were in the game. 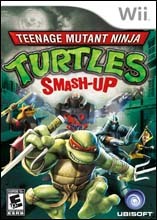 But TMNT: Smash Up actually manages to do enough of its own thing to not QUITE feel like a blatant rip-off, and while it could stand some polish, expansion and revamping in certain areas, it manages to, at times, be something that is worth playing for fans of both Smash Brothers and the TMNT. The story of the game is standard fare for the series, though it’s kind of weird when taken in context. Master Splinter decides to hold a fighting tournament to test his students (and April and Casey, for some reason), to see if they are as strong as he hopes. If they win, they earn a prize from his trophy case (IE a hidden character). They will also potentially have to face him, however, as he has plans to participate as well. Now, this would be a fairly boring story on its own, so thankfully the game derails that about halfway through and decides to make the story another “Shredder tries to do bad things and the Turtles have to stop him”Â storyline, which I’m fine with, though the story itself is kind of confusing from this point. I mean, for someone who appreciated the 2007 movie and the original series it’s fine and does its job well enough, but the continuity and characterization are confusing. Karai is presented as a scheming backstabber, which has (to the best of my knowledge) never been a facet her character, the version of the Shredder the game is using isn’t really a regular character in the series at this point, and the game appears to be playing by Season Two rules (based on the current season), which makes the whole “characters looking like their movie counterparts”Â gimmick more confusing. The story, when the continuity is ignored, is fine and all and it gets the job done, but it’s confusing when taken in context, especially considering the game didn’t even NEED much of a story to begin with. Game Mode wise, the game is pretty robust; you get the standard Arcade and Battle Royal, AKA Versus, Modes, as well as a Tournament mode, a Swap Out mode where players are shifted in and out as they win or lose, and online play. You can also play unlocked Bonus Games, test things out in Practice Mode, play through Missions to improve and unlock things, unlock figures and create trophies to play for in Tournaments. In other words, what the game lacks in story it more than makes up for in play content. 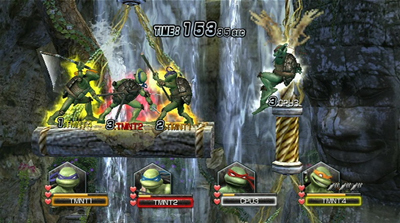 TMNT: Smash Up uses the visual style of the 2007 film, so all of the characters are 3D rendered and match their film counterparts well. Characters who didn’t appear in the film, such as Fugitoid and Shredder, are matched up to that style well enough and fit in without looking out of place. The graphics are generally clean looking and feature lots of detail in both the animations and environments, and the combat generally looks satisfying. The game isn’t visually impressive in the strictest sense, but it looks quite good overall for a Wii title and uses the capabilities of the system acceptably. The music mostly consists of solid rock and electronic tracks, which compliment the game well and lend acceptably to the experience. The voice acting is done primarily by the TV show voice actors, and is generally pretty good, especially for the Turtles themselves, who sound exactly as they should. 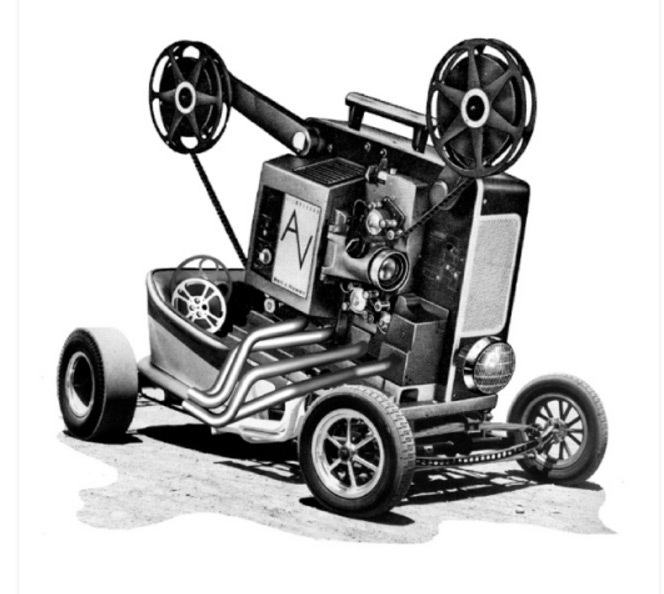 The sound effects are generally acceptable, and while they don’t do anything to really improve the experience in any notable way, they don’t detract from it either. TMNT: Smash Up is essentially modeled after the Super Smash Brothers franchise, and as such, it should feel familiar to anyone who has played those games… which would probably be most Wii owners, to be honest. You’re given a weak and strong attack which can chained into combos, and pressing different directions with each button generates additional special attacks. You can jump, dash, grab and pummel or toss opponents, and block attacks as needed with the appropriate button presses, and you can dodge as well by pressing the block button and different directions. 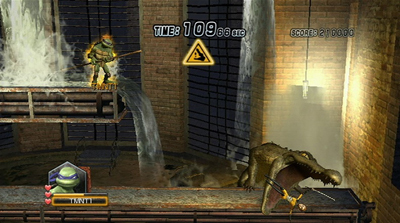 The game does offer its own unique additions to the formula, like the ability to grab walls and run up them or triangle jump off of them, the ability to bound from walls with powerful attacks, and the ability to grab poles in the environment to propel yourself elsewhere or attack from, but for the most part, you’ll be familiar with TMNT: Smash Up if you’ve played a Smash Brothers game. The game also supports a full range of controllers, including the Wiimote on its own, the Wiimote and Nunchuck combo, the Classic Controller and the Gamecube controller, each with its own strengths and drawbacks, so whatever preference you have is accommodated here. TMNT: Smash Up does do a few notable things to differentiate itself from the competition, however. First off, instead of having items to collect and use, the game uses Ninja Powers, which are essentially similar, but different enough to be interesting. Basically, glowing balls fall from the sky that you can collect by pressing attack, which then adds them to your inventory to use. You can use these abilities at the press of a button, which will throw shurikens or caltrops at foes, blast fire at them, summon wind around your character, fill the screen with damaging energy claws, and other interesting things. Weaker abilities come with multiple uses, while stronger abilities come with less, and you can only carry one at a time, making your choice of ability vital, though you can change the ability to be acquired by targeting the ball and pressing a button to change it into something else. 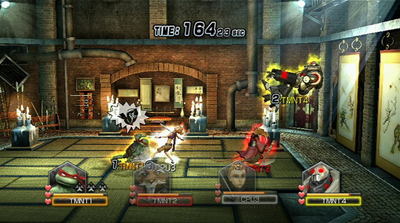 The game also employs Tag Team battles, where you have two characters available to you (one you control and one in reserve) that you can tag in and out as needed, either normally or through special team grapples that do plenty of damage and tag in the fresh partner whenever you need the assist. The game also uses a standard life bar instead of using the percent based life measurements of Smash Brothers, meaning that depleting an opponent’s life bar can take them out, no knockout needed. 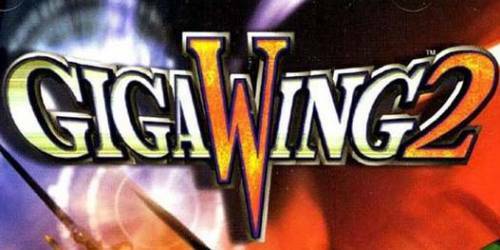 The game offers the standard brawling battles for up to four players, individually or in teams, as well as a fairly basic Arcade Mode for you to tear through, but aside from ripping through the Arcade Mode there’s a pretty decent amount of stuff to do with the game. You’ve got your typical Survival Mode, for single and tag team play, that asks you to rip through numerous enemies and survive. You’ve got the ability to go online and challenge friends and strangers in battle. You’ve got the ability to host Tournaments and Swap Out matches where the winners or losers stay (basically like playing in an arcade). Finally, you can practice your abilities and learn the layouts of the stages, as much like Smash Brothers, the stages come with all sorts of nasty traps to avoid and use to your advantage. You can customize the settings for versus matches as you wish, depending on what items you want to see, how you want matches to be won, and how much health you want players to have, and so on, much like one would expect, to keep things interesting. 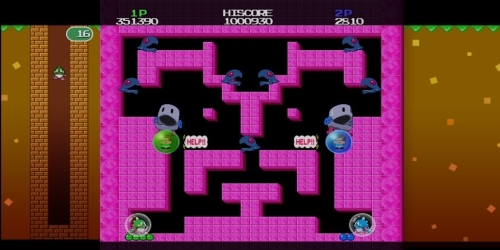 The game also offers all sorts of unlockable content, like characters, bonus games, stages, figures, trophy pieces you can use to assemble trophies you can then battle for, and more novelties. For fans of the series, TMNT: Smash Up is a feature-rich good time with lots of novelty and charm built-in that’s worth picking up, simply because it’s a product fans will love. Everyone else, however, may want to consider a few things first. Now, a big part of the appeal of the Smash Brothers franchise is that it features a large group of characters who are unrelated by anything but parent company (and with the latest game, that’s not even the case) beating the mess out of each other, and as such, the novelty of the experience carries the game. Fine. TMNT: Smash Up lacks that inherent novelty, and as such, has to actually be a BETTER game to be worthwhile, and while it PLAYS better than Super Smash Brothers Brawl in most respects, it doesn’t do much else better, sadly. The game offers up sixteen playable characters, each with a secondary outfit that can be unlocked, which is nice, but compared to the MASSIVE roster of Super Smash Brothers Brawl, the roster in this game doesn’t really impress. Now, I haven’t watched every episode of the current series of cartoons, so maybe sixteen characters (including three Rabbids, no, really) was all they could come up with. I mean, I can count at least six, between the stone generals from the 2007 film, Leatherhead and Baxter Stockman, but maybe Ubisoft and Game Arts weren’t aware of them or didn’t consider them worth using. Fair enough, but this doesn’t make for a wide variety of characters, and considering that the TMNT franchise has been around for a quarter century at this point, maybe cramming in some characters from the older TV series or the comics would have been worthwhile to pad the roster a bit. The other major problem is that the game doesn’t really do anything to differentiate itself from the aforementioned Smash Brothers series, aside from some small gameplay tweaks that don’t change enough to make the game feel fresh. There’s nothing wrong with upgrading your wheel instead of reinventing it, but this isn’t so much an upgrade as it is a fresh coat of paint. The game features a few minor gameplay tweaks, yes, and these tweaks do add some additional strategy to the game, which is fine. However, the game itself feels virtually unchanged from the Smash Brothers series in most respects, complete with silly mini-games to unlock figures. With more depth and variety to the game this sort of lack of originality would be forgivable, but you can pretty much unlock everything of worth in the game (except for the few characters who need over one hundred versus matches to be played before they’re unlocked, WHICH IS NOT REASONABLE) in about four hours, which is, frankly, kind of weak. If the game were fresh and exciting enough to feel like a whole new thing, the lack of depth and replay value wouldn’t sting so much because it’d be a great new experience that would generate its own need to be replayed. On the other hand, if there were tons of replay value and depth to the game, the lack of originality wouldn’t sting so much because there’d be so much to do that one could swallow the “ME TOO!”Â nature of the game. As it is now, however, while the game is generally fine on its own merits, it feels too derivative and shallow to be anything but a copy of a more successful game instead of an awesome game on its own. TMNT: Smash Up is a surprisingly solid Smash Brothers style game that takes the core concept of the former and applies it to the mechanics of the latter in a way that’s functional, but not terribly exciting. The story is acceptable, there are plenty of game modes to play with, and the audio and video presentation is mostly strong. 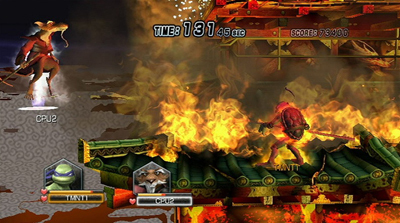 The gameplay is directly similar to the Smash Brothers series, but enhanced and developed enough that it isn’t an exact copy, and most of the changes are improvements. 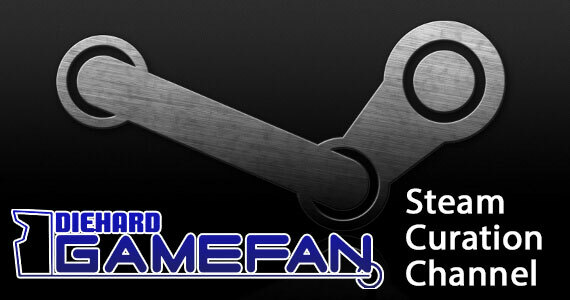 There are also a decent amount of unlockable items, characters, costumes and other novelties to find, and with multiple different ways to play against others, online and off, the game will keep fans of the franchise and the game style interested for a while. However, the game feels lacking when compared to something like the Smash Brothers series, as it lacks any really significant changes to differentiate it in a notable way, doesn’t have nearly the amount of content to use and unlock, doesn’t last as long and doesn’t lure you back for more as well as its inspiration. It’s not that TMNT: Smash Up isn’t fun and enjoyable, it’s that it isn’t fun and enjoyable ENOUGH to own unless you’re a fan of the franchise, as it simply doesn’t do enough different and doesn’t offer enough to make it worth a full price purchase. Teenage Mutant Ninja Turtles: Smash Up is generally pretty solid overall, but it lacks the variety and replay value of something like the Smash Brothers series, which hurts it in the long run. The story is acceptable, there are plenty of game modes to work with, the visuals are mostly pretty, and the audio is quite good. The gameplay is solid and at times better than that of Nintendo’s inspiring franchise, the game offers online and offline multiplayer, and there are a decent amount of things to unlock for fans of the game style and the franchise. 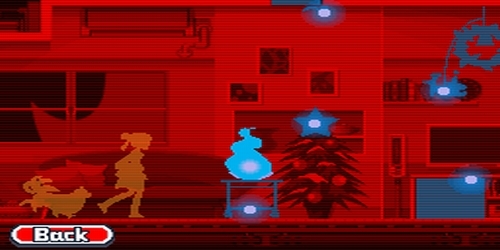 However, the game lacks in variety, as there far fewer things to unlock and do with the game than in something like Smash Brothers, the gameplay isn’t different or inspired enough to feel like anything but a knock-off, and the game lacks replay value as everything is either easy or tedious to unlock. All told, TMNT: Smash Up is a good value for fans, and a sequel with more characters and depth would be something worth seeing, but as it stands now anyone who isn’t seriously into this sort of game or the franchise isn’t going to get their money’s worth from the game.